If you&apos;re planning your projects for the year ahead, spending time on making your home or workspace more current with what&apos;s important to you right now and what will inspire and motivate you over the coming months can be a powerful way to start. A great way to do this can be a creative wall, where you collect together images and quotes to keep you on track. Using Sugru means you can hang up so much more than flat images. You can include all sorts of objects - things you&apos;ve collected over the years or made yourself, and since Sugru sticks to pretty much any surface and can hold up to 2kg, you can be as specific as you like with making your wall right for you! Sugru also makes this possible without any messy drilling. Gather a collection of objects that you want up on the wall, a tape measure, a pack of Sugru and some D-hooks and nails. Play around with the layout until you are happy and measure the space between the objects and mark the wall to know where you need to put your Sugru hooks. 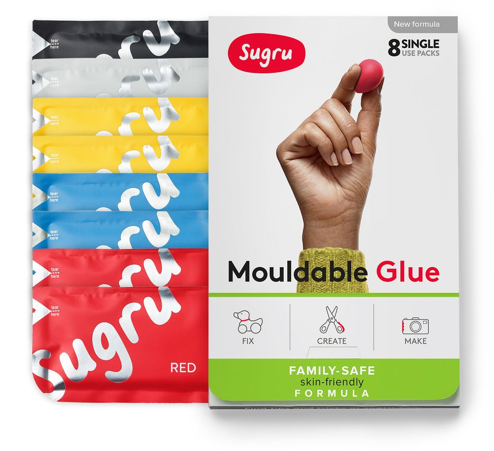 Cut open one single use pack of Sugru. Roll it into several balls of similar size. NOTE: depending on how many items you want to hang, you may need more than one pack. If you&apos;re using D-hooks, stick and shape one ball to the wall, fitting a nail through the middle of it. Then stick and shape another ball on the object and stick the D-hook to it, pressing down on it so that it is secure. If you are hanging objects that don&apos;t need D-hook, simply stick and shape a hook directly to the wall. Leave the Sugru on the wall and on your objects to cure over night and voila - you&apos;ve got drill-free hooks! Now you can hang up your favourite objects to complete your creative wall. And there you have it - your very own creative wall! The best part is that it doesn&apos;t have to stop there. As you continue to plan your projects for the year ahead, you can continue to add or replace things that inspire you. Just repeat the process above if you need more hooks. For more creative decoration ideas check out our guest post from MakeSpace on 12 Magical Ways To Make Over Your Living Room Without Drilling.